Cadillac Coupe de Ville 1978. Best 60-foot is 1.26, and the best 1/8 mile is 5.50. We have a track near Copenhagen where I live, but it’s in Sweden. The best ¼ mile time is 8.96, but on a very poor track, the potential of the car is 8.70. My goal is to take the car back to the U.S., and race in Ohio where my good friend and the guy I bought the car from lives. And maybe go to Georgia and Florida to some of the races down there. Not really, but I call it the Big Yellow Refrigerator when I talk about its race appearance. 565 BBC Scott Shafiroff pro series, with an aluminum block. It’s getting sprayed with 325 hp on a Speedtech nitrous plate. BTE Top Sportsman Powerglide, and it gets a beating moving 3,800 pounds, but never had a break down on it. I have race friends who chose BTE because of the performance in the Cadillac. And I would buy BTE anytime, because of the quality. Johnny Lindberg who races Alcohol Funny cars in the U.S. He is a very young man who knows how to both drive and tune his car. Not sure, maybe a fuel-saving vehicle so I can spend more money on the race car. 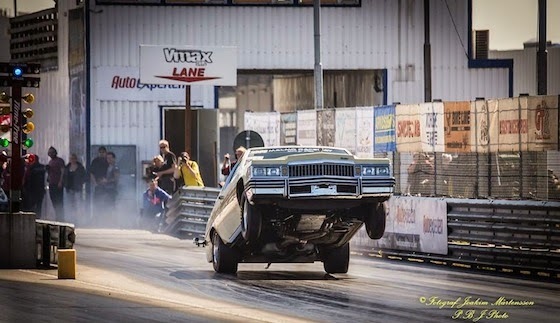 And if we are talking race car, my Caddy has given me tons of good experiences and surprises, and I love to have people come up and tell me how much they love seeing the crazy wheel stands the car makes. But if I should make a step in classes, pro mod or pro extreme could be fun. None really, I go with the feelings, and try to find time in a busy daily life to still be 100% ready on the racetrack.